What is Onychogryphosis? It is a thickening of the nail plate, growing hornlike with transverse grooves on the surface of the nail mode of a snail shell. It is a disease of the nail, more frequent than you can think. It affects mainly elderly people since it is linked to circulatory deficiencies much more frequent in the elderly. 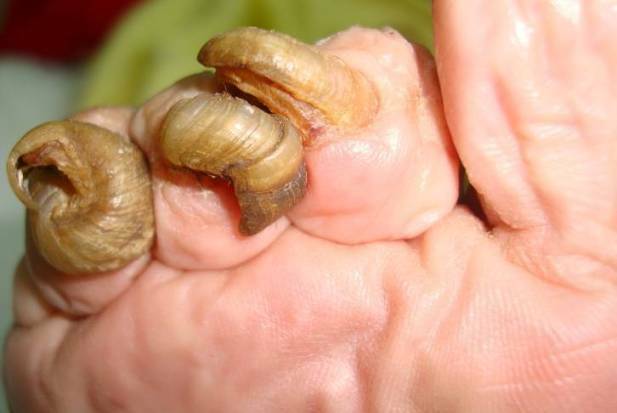 Onychogryphosis or Ram’s Horn Nails can also be found in young patients associated with other diseases such as scleroderma or psoriasis. The thickening of the nail tends to be slow, since the affected nails usually have a delayed growth. However, the normal thing is that the nails present a very striking thickening, because the person is incapable of cutting the nail at home by domestic utensils. Popularly it is believed that the nails are thickening over the years, and that is why it is normal to find a nail like that when reaching certain ages. This belief has its nuances. Obviously, the aging of the person is causing a loss of elasticity associated with the lack of collagen and other proteins at the dermal level. However the nail must keep a uniformity in its thickening, and it will never happen to have more than 2-3 mm of thickness. Onychogryphosis causes an anarchic thickening of the nail plate and detracts from the original shape of the nail. In these cases, this anomaly cannot be considered normal and it is necessary to go to a Podiatrist to treat the problem and advise us about the care that this disease deserves. The causes that produce the thickening of the nail in the shape of a horn are several and sometimes independent of each other, that is to say, that may or may not coincide in a person several causes of onychogryphosis. The main cause of onychogryphosis is the alteration of the nail matrix by different internal or external agents. For example, the circulatory alterations cause a lack of blood supply at the level of the nail matrix, which leads to a slow and anarchic growth that causes a thickened nail with transversal cuts that coincide with discontinuous growth stages. A hit or trauma in the matrix area also produces an abnormal growth of the nail, due to the partial destruction of the matrix cells that are permanently and irreversibly affected for a lifetime. It is common to find an onychogryphosis nail after having suffered a blow or a stomp on the nail, and often after having lost it for this reason. Certain dermatological diseases such as psoriasis or scleroderma can also cause a thickening of the nail plate. This thickening has differences with respect to the previous one since it affects all the nails, it also affects the fingernails and the thickening is usually more uniform. It seems that the cause that leads to an alteration in the production of the nail is the involvement of the matrix cells. The nails grow from the root of the finger at a rate of about 4-5 mm per week. This growth is made from the ungueal matrix that is protected by the skin at the base of the nail below what is commonly called the cuticle. The matrix is a particularly sensitive area and is altered relatively easily against blows or trauma received in this area. Sometimes a stomp can cause the nail to grow badly and to increase in thickness. Other times the deficient blood supply at this level can cause an abnormal growth. When Ram’s Horn Nails is associated with dermatological diseases such as psoriasis or scleroderma, how it is produced has to do with increased cell production at the dermal level and alteration in collagen synthesis. The conclusion is that the cellular matrix produces more nail cells than normal, which causes a saturation of the nail plate and the consequent thickening of the nail that is unable to perform a correct cellular replacement. Thickening of the horn-shaped nail plate with transverse grooves like the snails shells. The inability to use due to the thickness of the nail. Pain due to conflict with the shoe. The nail does not have enough space and is stuck in the nail bed. Appearance of calluses and hardness in the subungual area. These callosities obey to the increase of pressure by the pressure exerted by the footwear on the nail. Appearance of nail residues under the nail, due to the alteration of the nail’s metabolism. Impossibility to cut the nail due to the hardness and thickness caused by the nail. The nail may change color and may appear yellowish or brownish due to bacterial or fungal infections (caused by fungi). The diagnosis of onychogryphosis is simple, since the appearance of the nail is very characteristic and gives rise to few mistakes. However, the complication of onychogyphosis is to find the cause that provoked it and also distinguishing it or associating it with other diseases. To rule out a fungal or bacterial infection coexisting, a culture of the nail plate can be performed. The method of identification of the fungus consists of the cultivation of the infected material (nail plate, nail dust) in suitable culture media, such as Sabouraud agar. It is important to investigate about the circulatory status of the person. In people with vascular disorders of the lower limbs, this alteration of the nail plate is common. It is also necessary to remember some traumatic episode on the nail, such as a stomp, a blow or the fall of a blunt object on the nail. In athletes foot, the appearance of bruises under the nail is very frequent, due to the use of sports shoes. The appearance of this hematoma with relative frequency can cause the nail matrix to be altered and an abnormal growth of the nail is caused. There is no definitive treatment for onychogryphosis. At the moment when the nail matrix is affected by any cause that may cause a nail thickening, the nail can not be recovered and it is not possible to return to its original state. This circumstance makes the palliative treatment and aimed at reducing the problems that cause the nail to have acquired thickness. The Podiatrist can guide you about the care that you should take with this type of nail, although it is advisable to go from time-to-time to a podiatry consultation to make a correct cut of the nail, while thinning the nail with the help of electric micro-motors. These nails are dangerous to cut at home using domestic instruments, since there is a risk of producing a cut under the nail. On the other hand, it is difficult to cut this type of nails with any conventional pliers or nail clippers due to the hardness acquired by the nail plate. This recommendation makes much more sense in people with circulatory problems of the lower limbs as is the case of diabetic people or with alterations of the peripheral circulation. The prevention of this type of problem can only be directed to avoid certain risky habits, because in certain cases it is not possible to prevent the appearance of this alteration if there is another disease that produces it, as in the case of psoriasis, diabetes, atherosclerosis, etc. Do not wear narrow shoes that compress the foot in the area of ​the fingers, which can cause trauma to the nail matrix or decrease blood supply to this level. Go to a Podiatrist if the nail has turned black or bloodied after being hit or stomped. If you have diabetes, you should go to the Podiatrist periodically to cut the toenails and he guides you about its care. Avoid walking barefoot which can make you more vulnerable to receiving bumps on your fingers. 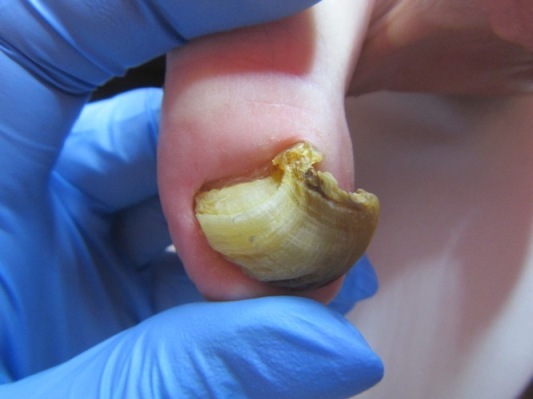 The toenail appears thickened in the shape of a horn, so that the cut and the thin. If the nail changes color and appears yellowish or brownish, to investigate the cause of this alteration. If I have diabetes or have vascular problems in my legs, to cut my nails and guide me about caring for them. If I have suffered a blow to the finger and the nail has gone black, so that I can treat it and prevent the nail matrix from being injured. Whenever I think that the nail is sick so I can orient myself on the existing treatments.